Happy hump day! 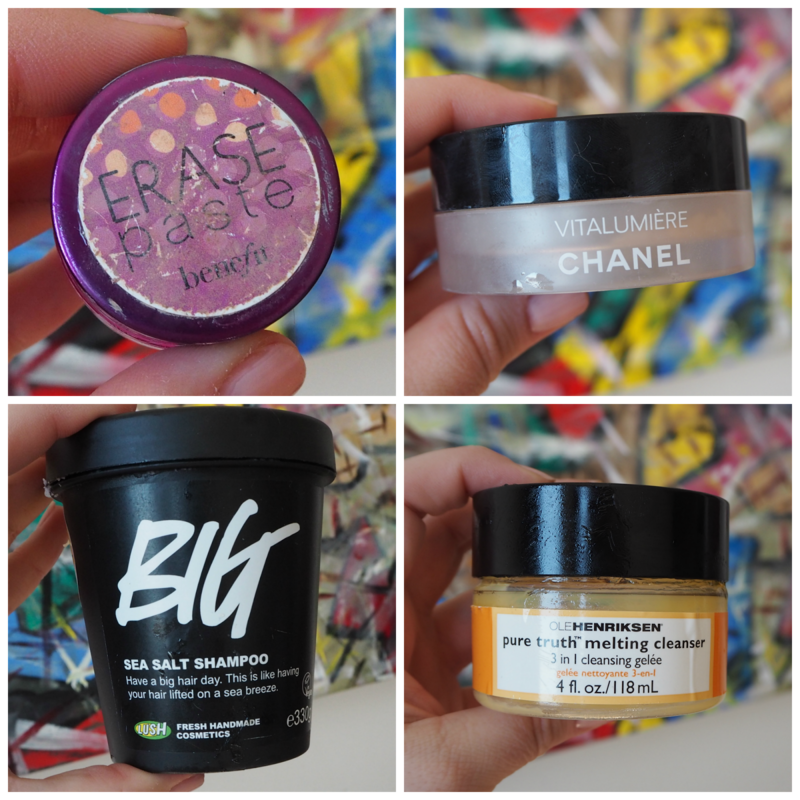 Here's a quick run down of my recent empties and links to any full reviews I have done. Benefit Erase Paste-A very thick concealer that had gotten way past its best, this concealer is marketed as a brightening concealer for under the eyes. I found it way too heavy for under my eyes and that it really creased up, but I did like it as a spot concealer when applied with a small brush. The lightest shade has a slightly salmon undertone to it so it theory should be good for cancelling out discoloration but I do prefer the Bobbi Brown corrector I reviewed here. Chanel Vitalumiere Loose Powder Foundation-I'm not generally a fan of mineral/powder foundations but I actually did really like this one. I prefer it to the Laura Mercier and felt it was lighter and less cakey than the Laura Mercier. I tended to buff this over my skin as a setting powder on days when I really wanted to have a full coverage and this is also great for touching up on planes, trains and automobiles. Lush BIG shampoo*-Definitely my all time fave Lush shampoo, I love the chunky salt crystals for adding oomph to my fine hair. I think the reason I love this shampoo so much is that it is so weird! I have never used anything like it. It has *actual* big sea salt crystals in it and you literally need a tiny bit of this shampoo to get a rich lather and my hair has never ever been so soft as it is with this shampoo. Aside from sea salt it also contains seaweed and coconut, lemon and lime, mandarin, neroli and vanilla. I can definitely see me repurchasing this over and over. Don't be put off or slightly freaked out (as I was) but the sea salt in the formula, it dissolves on contact with your hair. Lush UAE sent me this as part of a hair care parcel and it was the thing that immediately sparked joy when I opened it! Ole Henriksen Pure Truth Melting Cleanser-I reviewed this in full at the weekend-all of my thoughts are here. Lancome Eau Micellaire Douceur-hands down my favourite micellaire water for removing make-up. It doesn't dry my skin out or break me out. Admittedly I only use this when travelling on long flights (or if I have a very late night and I cannot be bothered to cleanse....) This is my fourth bottle. 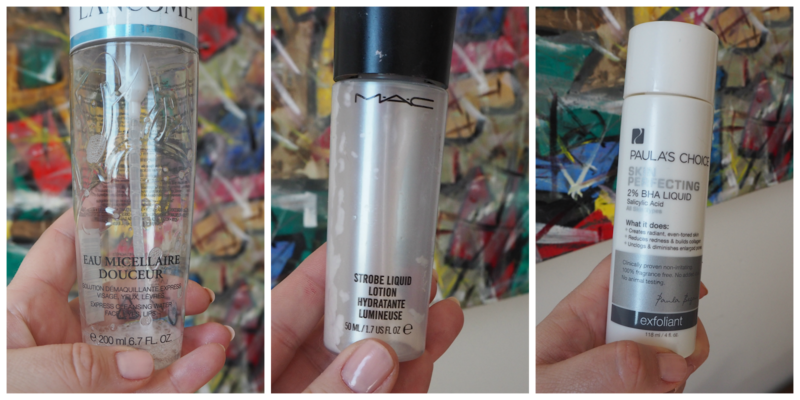 MAC Strobe Lotion-The lighter and more liquid version of the cult Strobe Cream, I love this as a primer or mixed with foundation. It gives a violet toned pearlescent glow to the skin and sits well under any foundation. It also lasts forever-I did a full review of how I use this in my Faux Glow post. Paulas Choice 2% BHA Skin Perfecting lotion-My first foray into Paula's Choice, I bought this from Look Fantastic at Xmas when I was in the UK. I honestly wasn't that impressed-I didn't see any improvement in my skin and I thought it felt very harsh and stripping on my skin. Not something I would repurchase. Sarah Chapman Skinesis Rapid Radiance Cleanse-One of my favourite clay based cleansers, this is my third bottle of the Rapid Radiance cleanser. I've done a full review of this product here and I really rate all of the Sarah Chapman products I have tried so far. 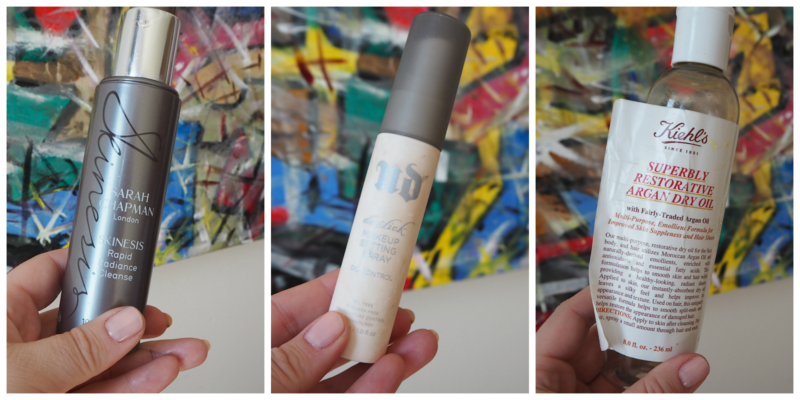 Urban Decay Deslick Make Up Setting Spray-this was a travel sized version but this is one of the better setting sprays I have tried and I have just repurchased a full size. I have very oily skin and this definitely helps to lock my make up down and keep it in place. Charlotte Tilbury Airbrush Flawless Finish Skin Perfect Powder-This is my fourth compact of this silky finishing powder and you can read a full on product rave of it here. The only thing I do dislike about this powder is when it gets to the stage it is in the picture above it's done-you can't eek out any extra from it! There are 3 products in the last picture-Anastasia Clear Brow Gel (which is a HG product and an absolute must have) and 2 mascaras. Dior Iconic Overcurl mascara is amazing-I loved it and I reviewed it in full here and you can also see it in action on my lashes here. The second mascara was not such a hit-it's the Laura Mercier Faux Lash mascara. 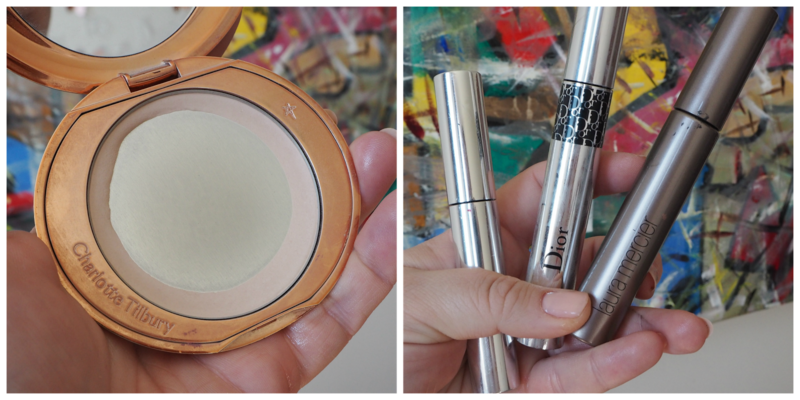 The brush is very large and scratchy-it felt like the NARS Audacious mascara wand which I really did not like. The actual mascara on the lashes looked great-my lashes were very volumised-but it flaked and smudged so badly on me and the tiny fibres in the mascara kept getting into my eyes and irritating them. I did persevere because I like the effect on the lashes but eventually I decided it wasn't worth it.